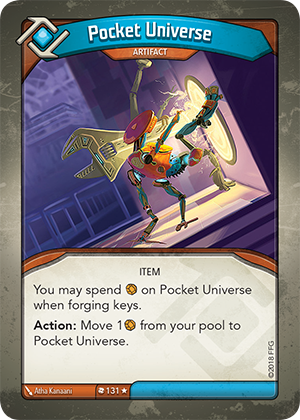 Card Text You may spend on Pocket Universe when forging keys. Does Æmber on Pocket Universe count towards how much Æmber a player “has” (e.g. for cards like Bait and Switch)? No. Only Æmber on a player’s identity card counts as “having” Æmber. Do I have to forge a key if with the Æmber on Pocket Universe I have enough, but not enough without it? Yes. If you are able to forge you must do so. This includes spending Æmber from cards like Pocket Universe or Safe Place. What happens to Æmber on Pocket Universe if it leaves play? If a non-creature card with Æmber on it (such as Pocket Universe) leaves play, the Æmber is returned to the general token pool, not the owner’s pool.